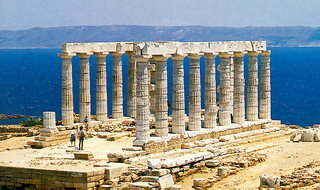 The sanctuary of Poseidon at Sounion is one of the most important sanctuaries in Attica. Sporadic finds point to the conclusion that the site was inhabited in the prehistoric period but there is no evidence of religious practice in such an early date. "Sounion Hiron" (sanctuary of Sounion) is first mentioned in the Odyssey, as the place where Menelaos stopped during his return from Troy to bury his helmsman, Phrontes Onetorides. The finds of the 7th century B.C. are numerous and proove the existence of organized cult on two points of the promontory: at the southern edge where the temenos of Poseidon was situated, and about 500 m. to the NE of it, where the sanctuary of Athena was established.